Peter William Vanderkaay (born February 12, 1984) is an American former competition swimmer who specialized in middle-distance freestyle events and is a four-time Olympic medalist. He was a member of the 2012 United States Olympic team, and won a bronze medal in the 400-meter freestyle event at the 2012 Summer Olympics. Vanderkaay was born in Royal Oak, Michigan. He grew up in Oakland Township, Michigan and attended Rochester Adams High School in Rochester Hills, Michigan. He has three brothers, all of whom are competitive swimmers. His older brother Christian Vanderkaay swam for the University of Michigan and qualified for the 100-meter breaststroke at the 2008 Olympic trials. His younger brother Alex Vanderkaay qualified for the 2008 Olympic trials in several events, competing and making the finals in the 400-meter individual medley, 200-meter butterfly and the 200-meter medley. His third and youngest brother, Dane Vanderkaay, also qualified for the 2008 US Olympic trials in the 400-meter freestyle. At the 2005 World Aquatics Championships in Montreal, Quebec, Vanderkaay won a gold medal in the 4×200-meter freestyle relay. Along with Phelps, Lochte, and Keller, their time of 7:06.58 was an American record. At the 2007 World Aquatics Championships in Melbourne, Australia, Vanderkaay again swam in the relay with Lochte, Phelps, Keller. They set a world record in the 4×200-meter freestyle relay with a time of 7:03.24. 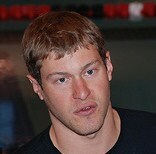 Vanderkaay won his first individual medal, a bronze, in the 200-meter freestyle at the 2008 Summer Olympics. Vanderkaay was part of the 4×200-meter freestyle relay that set the world record as the American team finished first with a time of 6:58.56. The Americans were the first team to break the seven-minute mark in the relay, and broke the previous record, set in Melbourne by more than four and a half seconds. ^ "Peter Vanderkaay bio". swimming.about.com. ^ Evans, Hilary; Gjerde, Arild; Heijmans, Jeroen; Mallon, Bill. "Peter Vanderkaay". Olympics at Sports-Reference.com. Sports Reference LLC. Retrieved July 1, 2012. ^ "Band of Brothers (6/26/2008)". usaswimming.org. ^ "Men, 4×200m Freestyle, Final, 29 Jul 2005 – 19:37". swimrankings.net. ^ "Men, 4 × 200m Freestyle, Final, Saturday, March 31, 2007". washingtonpost.com. ^ "Men's 4 × 200 m Freestyle Relay – Final". NBC. August 13, 2008. This page is based on the Wikipedia article Peter Vanderkaay; it is used under the Creative Commons Attribution-ShareAlike 3.0 Unported License (CC-BY-SA). You may redistribute it, verbatim or modified, providing that you comply with the terms of the CC-BY-SA.